An all-white set presents many challenges, from design to execution to maintenance. I spoke with designer Walt Spangler and the STC run crew about their experiences with Old Times, and even learned the secret ingredients to keeping whites bright and cigarette ash in its proper place. And when a set’s this minimal, it’s not a simple process – sometimes a designer has to go through fifty different ashtrays to find the perfect one. Steven Culp, Holly Twyford and Tracy Lynn Middendorf on the set of the Shakespeare Theatre Company’s production of Old Times, directed by Michael Kahn. Photo by Scott Suchman. The monochromatic nature of the design came about as discussions intensified about what color stage items should be – given the loaded meaning of everything in Pinter, it soon became evident removing most color except in Jane Greenwood’s costumes would allow the actors the clarity of expression the play requires. It certainly worked for me – when I saw the play, after a few minutes getting used to the all-white set in pre-show, it faded into the background as the actors themselves rightfully took command. Every eyebrow raise became all the more potent given the white surround, as faces took primary focus. Just as Eskimos have hundreds of words for snow, so matching whites across paint and fabric was a difficult task for Spangler and the STC scene shop. At the design center where they made the furniture, “they showed us every single white leather upholstery they had,” Spangler recalled, “it was painstaking.” Even a lampshade that was slightly off the exact white pulled focus and had to be changed. When a set becomes that minimal, the process becomes more challenging. 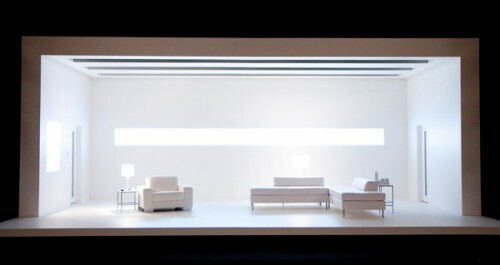 Lighting an all-white set has its challenges, and Spangler worked closely with lighting designer Scott Zielinski. There’s a lighting “trough” in the ceiling of the boxed set with the LED lights built in, so that the practical needs of the production are met with clean aesthetics. There are no unnecessary shadows in the course of the production, a testament to Zielinski’s skill. “It took some doing to get it that subtle, the finesse,” Spangler said, noting that there are hundreds of lighting cues in the show in order to keep it that simple. Even the build was particular. “Every flaw would be noticeable,” Spangler said,” there was no fudging by the shop, they were very careful. Even in the way the room is built is sturdy.” Seams had to be perfect. Not only was the backstage the cleanest I’ve ever seen, the consideration and skill that went into the build was clear from behind the set as well. It looked like it could withstand anything. The plywood was pristine. With all the care and attention to the design process and the build, keeping the set clean for every performance is of paramount importance. STC’s intrepid run crew for Old Times surely deserves a special Helen Hayes award for the time they spend restoring the set to its all-white glory. It’s repainted almost every night. The spike marks are in silver and gold pen so as not to distract. The crew spends at least forty minutes before each show in a four step process that includes some twenty minutes on hands and knees with Magic Eraser. During the performance they’re on high alert for any accidents. 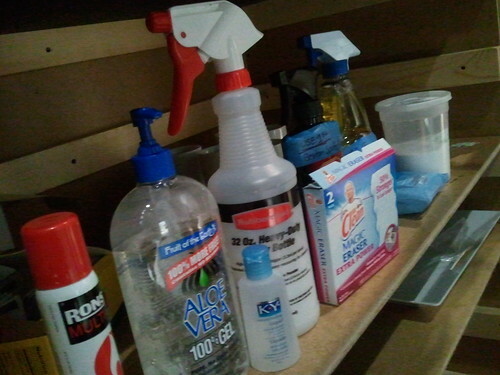 There’s a large supply of makeup wipes backstage for any emergency swipes to the couches, and aloe vera gel for the ashtrays to extinguish those pesky cigarettes smoked throughout the play. Yes indeed. It turns out that’s the other secret ingredient besides aloe vera gel to keeping the potentially messy cigarette ash in place and off the whites. From the sublime to the mundane. That’s what it takes to create the magic of theatrical minimalism. Many thanks to Lindsay Tolar at the Shakespeare Theatre Company, the run crew of Old Times, and Walt Spangler for the gracious interview. Only a Pinter play could inspire something so outlandish :). It’s been almost a year since I moved away from DC to NYC but STC’s production are still some of my favorite of all time.